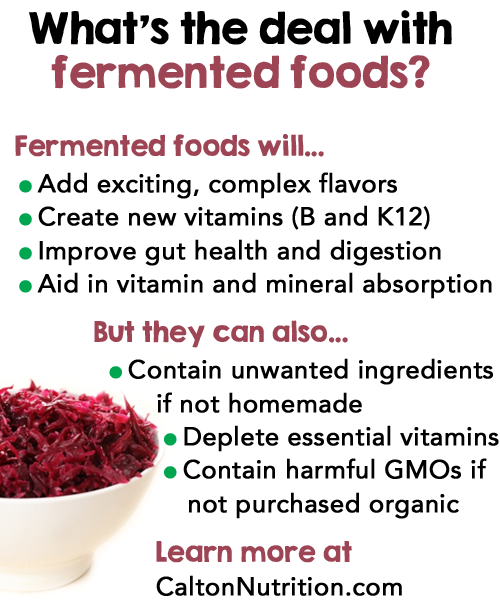 What's the deal with fermented foods? When we think of fermentation, we often think of wine or beer, but food can be fermented, too. In fact, fermented foods are a great way to enjoy your produce. Fermentation is also a great way to prepare and preserve your favorite produce! For tips like this, and more be sure you are subscribed to our weekly newsletter! Fermentation is the act of using bacteria, molds, and/or yeasts to create alcohol, acetic acid, or lactic acid, which then act as natural preservatives for food and its micronutrients. Fermentation can add exciting, complex flavors to food and can even create new vitamins, especially B-vitamins and K2, but sadly, it can also deplete others. Which is why we recommend taking a multivitamin that follows the ABCs of supplementation guidelines, such as nutreince. The big benefit to fermented foods is that over time, they can improve the health and efficiency of your gut. In other words, they can create an environment where proper digestion and nutrient absorption can take place. They accomplish this by stimulating the gut to produce hydrochloric acid, which is essential for both processes and can eliminate acid reflux naturally. Eating fermented produce such as kimchi, sauerkraut, cortido, or just about anything pickled can reduce or eliminate the need for digestive aids, and work to increase the population of healthy flora throughout your intestine, which reduces the need for pricey probiotics. We've put together a special infographic for you to share with friends and family, and pin so you can refer back to it later! Simply click the image below and pin it to your board! Do you have a favorite fermented food? Perhaps it's homemade, or an organic rich food brand! We'd love to hear about it over on Facebook. We'd also love for you to share this post with your family and friends by clicking the share button below!